Thanks to the kickoff of the 12th season at Fusion Theatre Company, Albuquerque has the opportunity to see a Tony awarding winning play only 12 days after it closed on Broadway. That's right, it didn't go to Chicago or L.A for its national regional premiere. Dennis Gromelski, Fusion's producer, made sure it would be here, but you don't have many chances left to see it. All 8 of Fusion's shows at the Cell Theatre are already sold out, but the show goes on tour soon (good news for our Las Cruces and Santa Fe readers!) and then circles back to Albuquerque, so there is still hope for locals too. Thanks to being adopted by professors, our late middle-aged siblings Vanya, Sonia and Masha, have always been different, from each other and from the world at large. 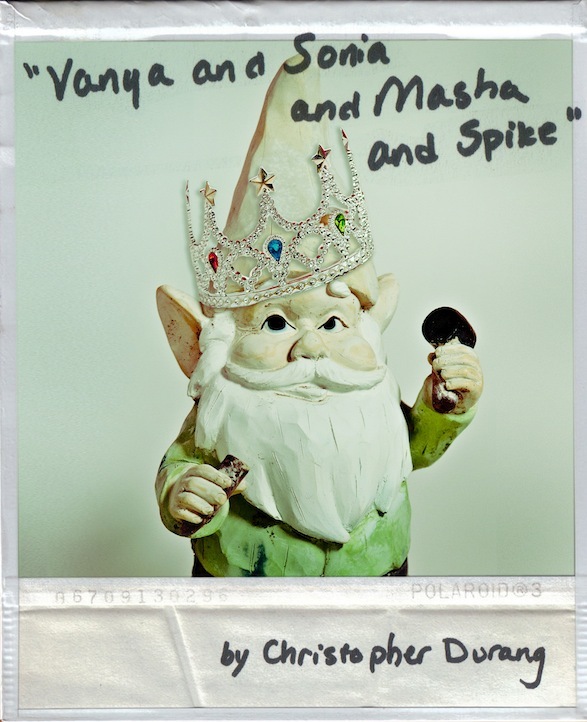 Written by Christopher Durang with plenty of pokes at Chekhov to be had, and set in modern Pennsylvania, the characters slide in and out of larger than life archetypes while revealing the bleakness and search for meaning in their personal stories. Sonia's answer to the question of herself descends often into stifling self pity, but Jacqueline Reid plays Sonia's moroseness with a sense of humor that prevents her from being two-dimensional. At times, the wallflower literally clings to the wall as the drama of her siblings unfolds in the home that Masha controls. But when Sonia's alter ego is played out at the costume party, her bitter shell begins crack as she transforms by the play's end. Clinging to the past, Bruce Holmes plays her brother, the conservative, closeted Vanya, who represses his sexuality, conforming to his own cherished (if outdated) ideals. His delightfully frothy monologue in the second act lamenting times gone by -- when America had a community built by the shared experiences that watching only four channels on TV could give you, when boys wore coonskin caps for unity in their love of Davy Crockett, when Bishop Sheen's ideals were embraced by popular culture, and entertainment was sincere yet silly, a time before tweeting and before killing hookers on video games -- builds to a crescendo that leaves many in the audience tittering with recognition. 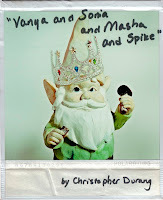 But it is Masha's appearance as the glamorous movie star sister, with boy toy Spike in tow, that truly mixes the pot and brings to boil everyone's latent characteristics. Played by Joanne Camp as both narcissistic and needy, Masha involves everyone around her in the drama that is Masha. Spike, her 20-something beefcake, is given a delightfully dumb persona by Ross Kelly, who uses his physical humor like a whip in a reverse strip tease that made the audience roar. As the lightning rod of Masha's insecurities, Spike's youthful sexual exuberance and attractiveness bring out her inner demons as well. With such heavy psyches to plumb, the actors delight in the black comedy that this script provides, darting between bleak and irreverent. While the three siblings wait for the appearance of the symbolic blue heron over the pond out back, there is the sense of hope that each chooses to go forward with, despite the changes that occur. Not to be forgotten are Elizabeth Huffman's Cassandra, the comic housekeeper with second sight whom no one believes, and Andrea Agosto's Nina, the ingenue who is young, innocent, optimistic, and basically everything that Masha is not. As New Mexico's only Equity theater, the talent of these actors is no surprise. 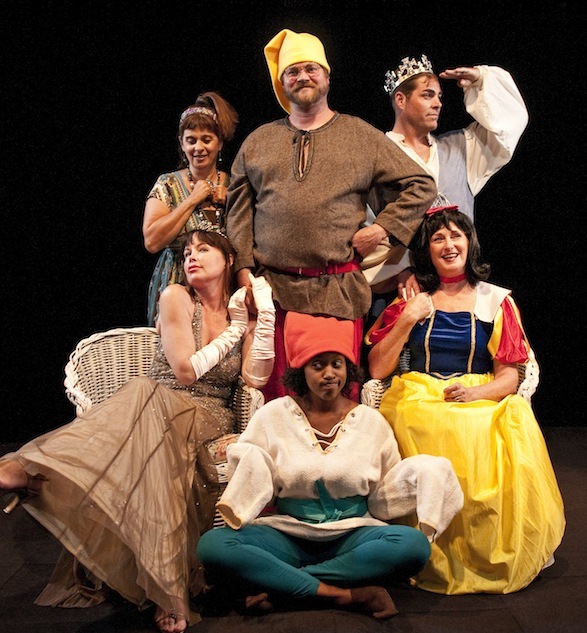 Directed by Gil Lazier, the company gives the script a good romp for all it's worth and delights the audience. With the company touring the production, Las Cruces will host the show Saturday and Sunday, September 14-15, at the Rio Grand Theater. 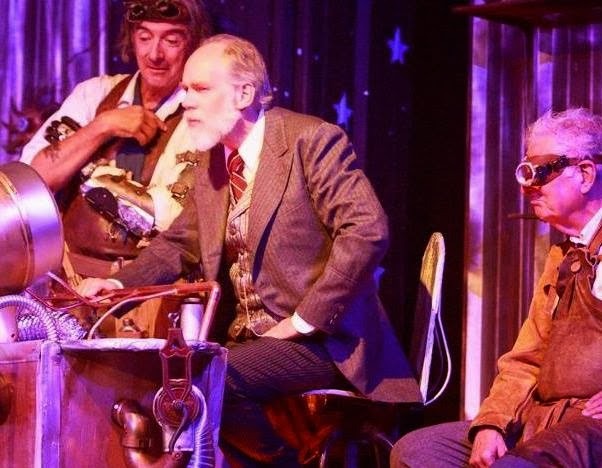 Albuquerque residents will get one more chance to see the show when it returns at the Simms Center for Performing Arts on the 20th & 21st, with student discount seats only $10 and the 21st as a "Pay What You Wish" performance, sponsored by the City of Albuquerque. 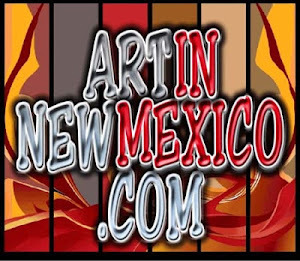 And, Santa Fe residents can see the show as well when it pulls into the Lensic on Friday & Saturday, September 27-28th. For complete schedule information and ticket sales, visit the company's website at fusionabq.org/ and grab your chance to see this regional premiere while you still can! #HootiePie! Most reviewers would call this show a "romp," which is reviewer-speak for, "The audience really got into it." 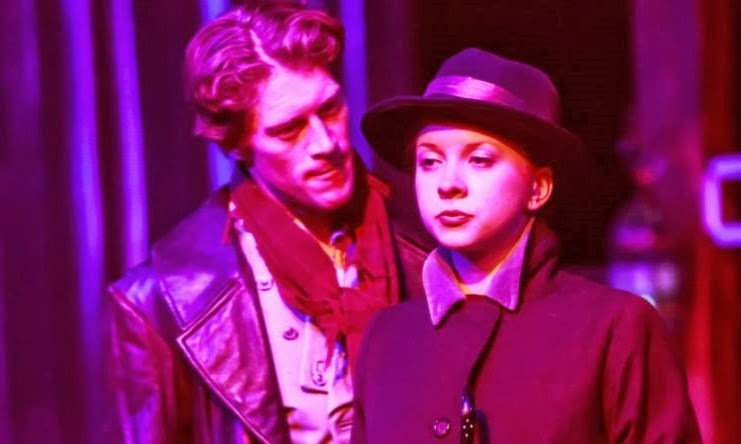 You can romp all you want onstage but if the audience isn't romping with you? Crickets. 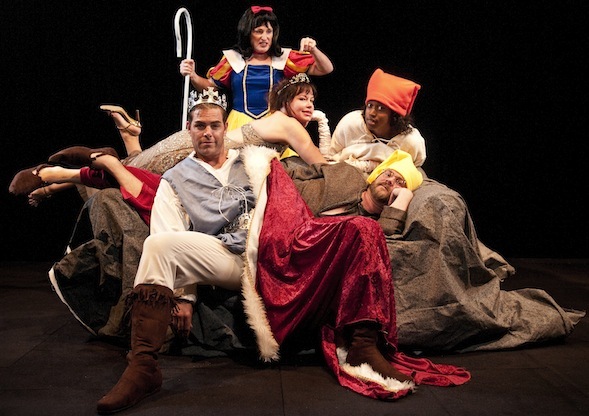 Thankfully, that's an impossibility given the show that's kicking off the 84th season at Albuquerque Little Theatre, The Complete Works of William Shakespeare [Abridged], a comedy as you might imagine. 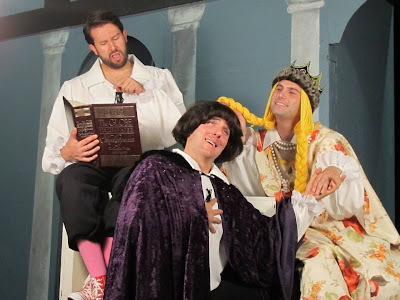 Leading the way are three players, Daniel T. Cornish, Ryan Jason Cook and Scott Bryan, and between lots (and lots) of wig and costume changes the trio manages to tell all, yes all, of Shakespeare's works. Don't believe it? I had to see it to believe it myself. 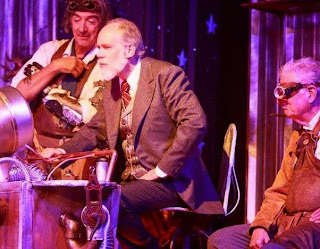 Written by the three original players, Adam Long, Daniel Singer and Jess Winfield, the play was first performed in 1987 and has been through several re-writes to keep the gags modern... so modern, one of the improv moments even got a poke in at Miley Cyrus' twerking. Starting with Romeo & Juliet, the original dialogue degrades quickly into the slapstick humor the audience expects. What they don't expect are all the moments that require not only their attention, but their actual participation. Ever dreamed of playing Ophelia? This is your show! Wonder how an actor finds a character's internal motivation? Oh boy, will you ever find out how in this production! Directed by George Williams, this is the actors' second time performing this play with ALT, having revived it after a 6 year hiatus and dusted off a newer version of the script for this go-round. 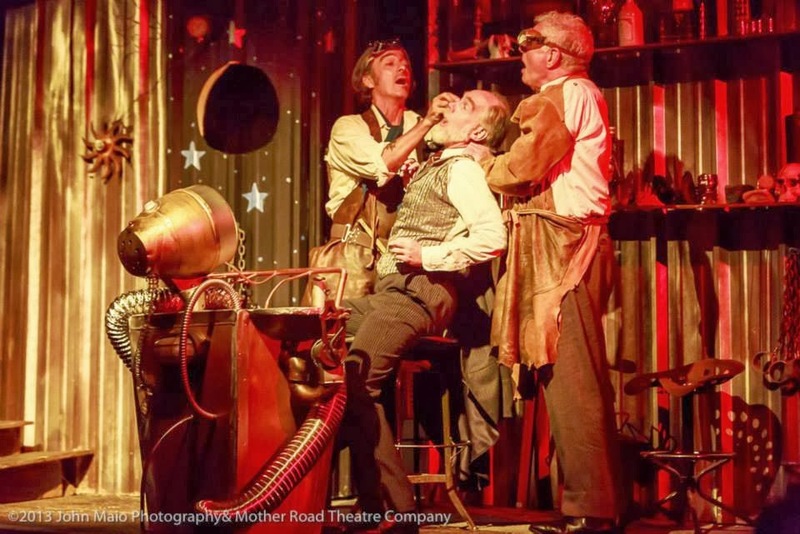 Given the long standing friendship between the trio, the chemistry onstage works beautifully, giving the dialogue's bantering nature believable realism. And, a show such as this requires actors who can think on their feet, react to the crowd and still stay on track, while keeping the show progressing forward. 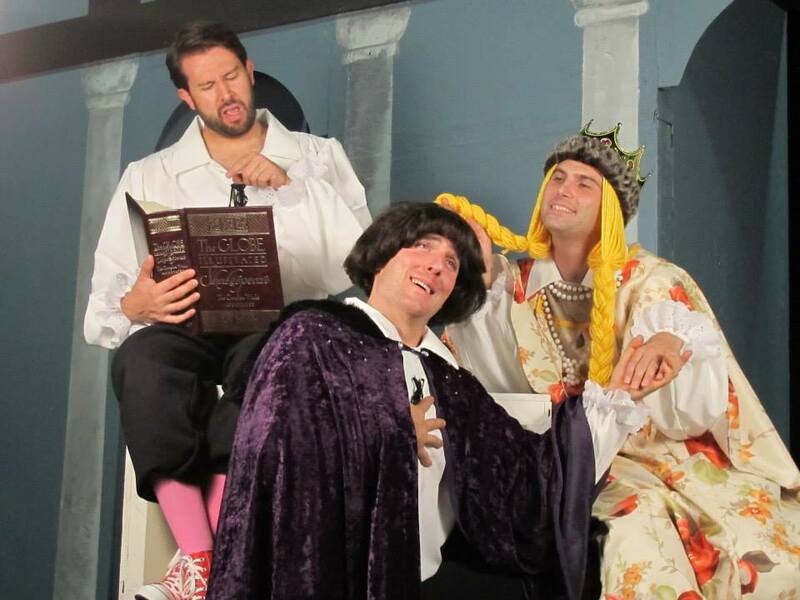 Acting as a tight knit troupe, the three excel at the challenge. 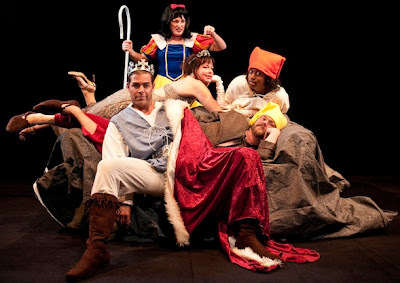 Re-imagining Titus Andronicus as a cooking show, Othello as a rap, and Troilus & Cressida as performance art are just a few of the ways this show manages to take the traditional and, well, condense it into something modern and new. 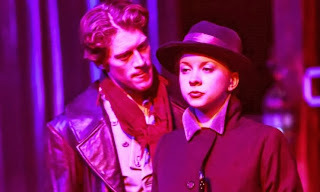 Personally, I had my own guffaw during their Macbeth, however, it is truly Hamlet that is given the most attention... indeed, the second act is dedicated to it. 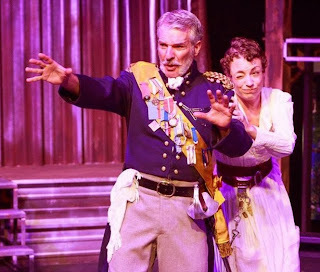 Sword fighting, men in drag, spooky ghosts and tremendous running in and out of scenes for costume changes keep this play rolling until the end, and with the audience so invested, it was no surprise they jumped to their feet, whistling and cheering, for a opening night standing ovation. Running until September 15, you can get your tickets and other info by visiting www.albuquerquelittletheatre.org or call 505-242-4750.